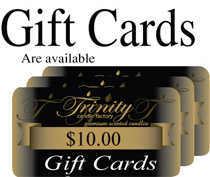 Only 116 left in stock - Order Soon! Protect Fine Furniture from Candle Heat! Protect Your Furniture From Candles Scuff and Scratches! Perfect for any Home Decor. A Must for any Candle Lover! The Candle Pad Furniture Protector. 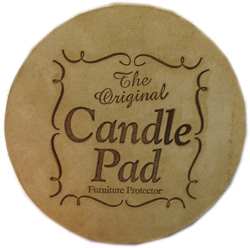 This Candle Pad will protect surfaces from scuffs scrapes, scratches as well as the heat from the candle that may discolor your furniture finish over time. The pad is approx. 4" round and works perfect under Trinity's Traditional Jar Candles, Reed Diffusers, Pillar Candles, Oil Burners, Wax Cube Diffuser's and Smelly Jelly. Perfect for any decor. I love the new Candle Pads to protect furniture from any scratching from jar candles. The display is also professional looking and it easy to showcase with the candles. I am currently giving one "pad" to each customer purchasing either the 5.5 oz or 12 oz traditional jar candles. It is my intention to sell them as another product if I have interest from returning customers. Thanks for sharing this new product with me and I have not seen anything that compares to it in the OKC area. I really like this pad. I can burn my candles down without worrying about my table top!